Life is Strange is one of the most amazing PC games that I recently discovered. Before I go on with my article, I have to mention that you can download and play the first episode of Life is Strange for free on Steam. I became interested to play the game after I watched a Let’s Play on YouTube, but I just watched the first 10 minutes of the video and stopped as I dislike spoilers. Of course, watching a video for 10 minutes is not really enough to find out if a game is really good, but absolutely enough to get a first impression. I talked about the game with a friend from Austria, she said this is the type of game that she would highly suggest to play, and she wanted to gift me the game but I rejected the idea as she was already too good to me in the past. I remember that she said that this is one of those games that you really want to impose on your friends. Just later when I got myself the game and played through the story, I started to realize what she meant. When it comes to PC games, I’ve been a bargain hunter since you can find the greatest deals during sales of known game stores and platforms. You barely hear from me anymore that I pay more than $10 for game, but most of the time I pay much less. Exceptions are there when it comes to highly awaited games, or games that I simply want to buy at the release day, and I am talking mostly about strategy or FPS games here. Now you might wonder why I tell you this, but it’s simple, at the time I write this article, I am 34 years old male and never thought I would be the target group for the Life is Strange story. As the first episode was now free on Steam, it simply wouldn’t hurt my wallet and I downloaded the game. I was so wrong, I went through episode 1 and five minutes later I purchased episode 2-5. That’s what I meant when I wrote about bargains, I am usually a very patient gamer and I will wait for the right deals, but this time I absolutely couldn’t wait and had to purchase the remaining episodes. It was a great move to make episode 1 free, it convinced me to use my wallet to go on with the other episodes. But now let me start to talk a bit about the game and why it convinced me. 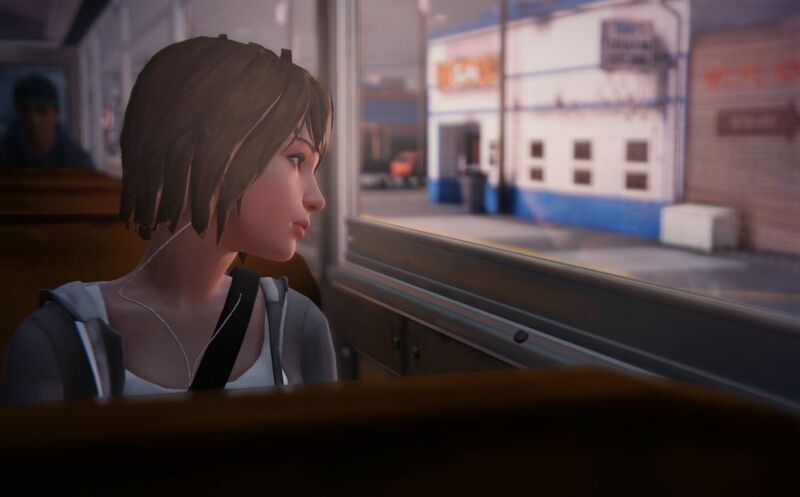 In the game, you play as Maxine “Max” Caulfield, she is 18 and decided to go back to a private school to participate in a photography course. At first I thought, oh no, please no high school drama story, but curiosity was there and I kept playing. If you checked out my blog, you probably have noticed that I am pretty much into photography, and it’s also the guiding theme in the game, which is why I wanted to find out more. As said, I am not so much into school drama stories, but in Life is Strange it’s presented so well, that you simply can’t stop playing. The game is not only about art, I think the game itself is art. I asked myself a couple of times why I wanted to go through this story, as I was still surprised in the moment that I played a game with a high school theme. The answer was simple and clear during gameplay, it’s the presentation, I mean all those beautiful game assets, textures, music, characters and the developers really found a way to make you become interested to play through the whole game. The whole setting looks so beautiful, the game invites you to experience the story of Max Caulfield, no, the game is almost forcing you to experience her story and Arcadia Bay, the town of the school. To explain further why the story is so interesting, I do at least have to spoil the first 10 minutes of the game story, but don’t worry, I won’t tell you much more than that. I asked myself how you could write about this game without revealing too much, and I think it’s best to just talk about the start of the game. As mentioned, you play as Max Caulfield, an 18 years old photography student at the Blackwell Academy, a private boarding school in Arcadia Bay, Oregon. It’s a usual school-day and you participate daydreaming in the photography class. You inspect some of your stuff on the school table and decide to take a selfie with your camera and your teacher Mark Jefferson does notice your state of distraction and asks you a photography related question that you can’t answer. A cocky classmate knows the answer and makes fun of you. The class hour ends and you want to go to the restroom to calm down. You hide while a furious classmate called Nathan enters the room and a girl comes in and has an argument with him. You witness how Nathan murders the girl and suddenly you discover that you can rewind the time and change the outcome so that the girl doesn’t die. So, much about the intro, and the game feature you learn about right at the start. 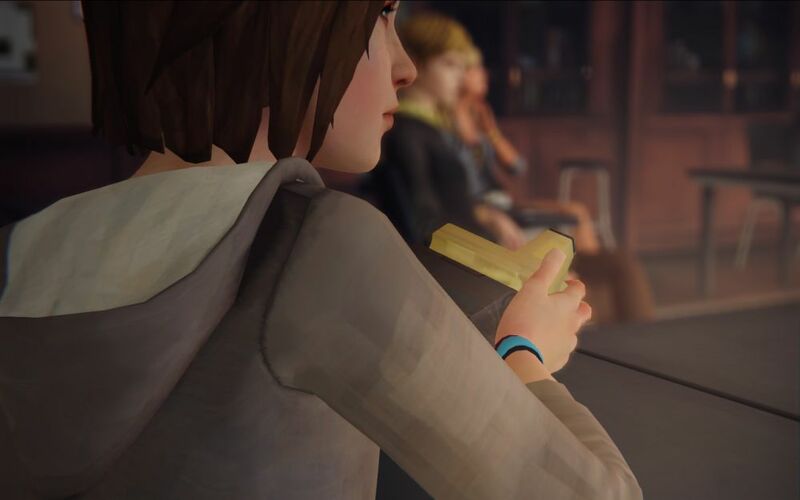 Life is Strange is about Max Caulfield who learns to get used to the power to rewind time. It’s about the Blackwell Academy and Arcadia Bay where a lot of things go wrong, and you will experience her story and investigate what just happened. The game allows you to talk with several characters of the story, you can interact with objects and your surroundings, and if things are not like you want them to be, you still have your recently discovered power to remind time and to influence people and events. Life is Strange doesn’t give you a lot of time to think about the possibility that the setting of the game might not be your case, the story and everything designed in the game makes you want to experience and find out what is going on with Maxine Caulfield, the town and the academy. It’s about choices, and how things might turn out if you influence the situation with your time-traveling powers. The game is about exploration and makes you want to unveil the events in the town. You will learn details about every character in the game, and there are many hints distributed on your path that will influence you and your future decisions. There will be moments where you have to smile and laugh, but there are also moments where the game wants you to cry. Life is Strange didn’t make me cry, but the story gave me goosebumps reaching from my arms to the head couple of times as the story worked so well together with the visuals and music. 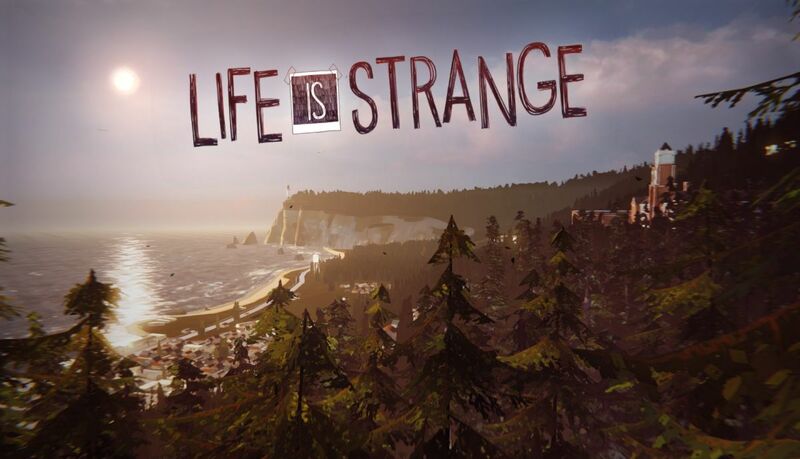 I experienced Life is Strange as an emotional roller coaster, and to be honest, maybe not the right game for you if you are emotional instable at the moment, and if things currently work not well for you in your own life. I am definitely hard-boiled, but Life is Strange definitely plays with emotions and can get pretty dark too. Before I end my article, I do also want to mention that I like the choice of the developers to include photography as a story theme. Again, I am saying that as someone interested in photography, but it did fit so well into the story. And by the way, if you are interested in photography as well, be prepared to find and hear a lot of geeky photography terms in the game, even the Steam achievements are related to photography as you need to find photo subjects during gameplay. It’s also worth to mention that the game is generally pretty hipster, sometimes it was really cool, but it was also sometimes cringe-worthy, but you can not take everything serious. Apart from a bit of cringe here and there, Life is Strange also wants to be taken serious, as the game is also about different social issues. My review about Life is Strange might be written and published a bit late since the first episode came out in January 2015 and the last episode of all five in October 2015, but sometimes there are hidden gems you were not aware off. Life is Strange is such a gem, I heard about it early enough I guess, but I never felt the need to play through the game until the first episode became free on Steam. I believe it would have been my game of the year if I would have played it in 2015. So, it seems now I am the one who suggest you to play the game! Check the first episode out for free, and tell me if it convinced you to buy episode 2-5 right away. I would have said I was a bit old for a high school drama but you do make it sound interesting. That’s exactly what I thought about myself, but I was curious why this game was so hyped by the gaming community and when the first episode became free, I could finally find that out. And then as said, I did end up purchasing episode 2-5 (laugh). I thought this game would be for kids, but it absolutely isn’t. In fact if I would have childs I wouldn’t let them play the game unless they become mature enough (I believe the game is rated 17 and above), because the game story has some really dark elements. With game assets, story telling, music choice of the developers, this game is a piece of art itself and it is no wonder why the game got so many awards. Yes, the time travel theme is quite interesting, and as hobby photographer the game kept me interested too. But as said, it’s a really emotional game and you will do everything like smiling, laughing, getting goosebumps, getting sad and even horrified. The developers put you from one emotion to another with this game, but that’s why it’s a master piece of game… everything threy created for this story works so well together. 1. Visit the Steam website: https://store.steampowered.com/ and click on the bright green button in the right upper corner of the site… I see it in German, but in English you should read something like “Download Steam Client” on the button. 2. Next you have to create your Steam account. You can either do this during the installation process of Steam if I remember right, or better, you do it before you even install the client. It’s explained here on their site: https://support.steampowered.com/kb_article.php?ref=7826-IHXM-4853&l=english and the direct link to the registration page is here: https://store.steampowered.com/login/ and think out a pseudonym to be used as username. 3. If you didn’t already, install the Steam client you downloaded. After that, use your account informations to log into the client. You should now see an icon in your Windows symbol bar… you can always right click on it and choose (exit) if you don’t want to play a game, as in this case there is no reason to be online with Steam, but this just as a side-note. 4. If you have the Steam client opened, click on “Store”, it’s very visible. At the following store page within the client, there is a search bar where you can type in game names. Type in “Life is Strange” and click on “Life is Strange Episode 1”. Since the game is rated for the age above 17 years, it might ask your for your birthdate before you see the store page of that episode. But when the page of the episode is loaded, you scroll a bit down to find the button “Free – Play Game”. If you clicked it, it should ask you if you want to install it, further more, it should now be a game you own in your Steam library that you can access if you click on the big library button in the Steam client. 5. In the Library you can check if you do already download the game, how much percent it’s done and so on. If it’s not already downloading, right-click on “Life is Strange” in your library a choose “Install Game”. If it’s already installed, you can right-click on it and choose “Play Game”. Both should also work by left-click since it will load the game on the right side in your client where you find those “install” and “play” buttons too. It seems a bit complicated as you might not know the popular Steam yet, but once you know Steam, and once it is installed, it’ll be always easy to browse the store to find new games. You literally just collect games there, the time of buying physical products is almost over since some time already. 🙂 Let me know if you have trouble with any step. And by the way, since you get Episode 1 of Life is Strange for free on Steam, and if you are interested in Episode 2-5 later on, you should take a look where you want to buy it. Currently I would suggest to buy on GamersGate, the links to episode 2-5 that I posted within my article…. because currenty you get episode 2-5 for not even $20 there, while every individual episode costs almost $20 on Steam. GamersGate delivers a Steam key that you can activate in Steam if you click in the menu on “Games” and “Activate a Product on Steam”. I say this, because sometimes Steam has nice bargains, and then out of the sudden you find the deals somewhere else. Importan is just that you look if they deliver a Steam key for activation, at least if you are like me and want to have your games in one place and hoard them on Steam (laugh).